Gabon striker Pierre-Emerick Aubameyang beat Ivory Coast's Yaya Toure to win the Confederation of African Football's player of the year award. In a vote of coaches and technical directors of Caf nations, Aubameyang got 143 points, with Manchester City midfielder Toure on 136 and Ghana and Swansea midfielder Andre Ayew on 112. Toure said he was "quite disappointed" but praised "brilliant" Aubameyang. Toure had won the award for the last four years and was recently crowned BBC African footballer of the year for 2015. He lifted the Nations Cup trophy in February last year as Ivory Coast took the African crown for the first time in more than 20 years. Aubameyang is the Bundesliga's leading scorer so far this season, with 18 goals in 17 league games. 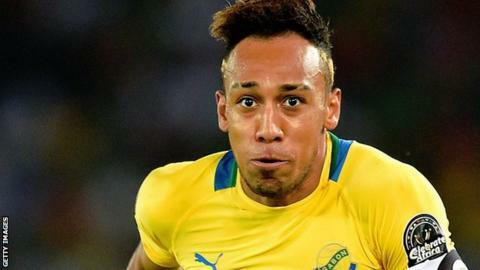 The Gabonese star thanked his family, team-mates and the Gabon president Ali Bongo Ondimba, who hailed Aubameyang's "dazzling intuition" and "an attack of unparalleled velocity". Victor Osimhen was crowned Youth Player of the Year after 10 goals in seven matches helped Nigeria win the Under-17 World Cup for a record fifth time. Herve Renard, who managed Ivory Coast to their Africa Cup of Nations victory, won the coach of the year award. The Frenchman, who led Zambia to victory in the tournament in 2012, is the first person to coach two different countries to the title. Mbwana Aly Samatta, the Tanzanian star who helped his club side TP Mazembe to the African Champions League title, was crowned African-based player of the year. Mazembe were named club of the year, having also represented Africa at the Club World Cup, while Ivory Coast and Cameroon were respectively named men's and women's national team of the year. Gaelle Enganamouit of Cameroon was named women's player of the year. She starred as the Indomitable Lionesses reached the second round of the Women's World Cup, having qualified for the tournament for the first time in their history.